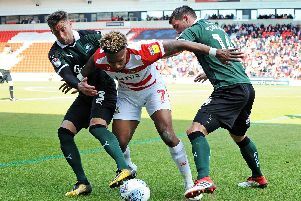 Doncaster Rovers delivered a tremendous performance to power past Championship side Preston North End into the fourth round of the FA Cup. Here is how we rated the individual performances on a memorable afternoon for Rovers. Produced excellent saves from Burke, Fisher and Johnson as well as a superb reaction stop from a Whiteman error in a commanding performance. Another good performance covering a right back, with his pace a valuable asset going in both directions. A tremendous performance, heading away everything at the back and reacting well with great strength to get the vital touch for Rovers’ second. Like Anderson, a rock at the back with his commanding header setting up his partner’s goal. Marshalled the defence superb. A strong performance at left back, pushing forward very well but dealing with pressure down the flank. Continued his trend of terrier-like performances in the midfield, pressing superbly and releasing superb passes forward. Another incredible performance from the midfielder who is so important for Rovers. Made vital contributions in both halves. Relished the opportunity against Championship opposition, growing in confidence as the game progressed. Not one of his most lethal performances and could easily have had a hat trick himself but did incredibly well for his goal. Also dropped deep well when Rovers were out of possession. A tireless performance with hard running to both press and put pressure on the Preston defence. His pace was a real asset to help Rovers both ease pressure and break quickly. Like Wilks, he dropped back into midfield attentively when Rovers were off the ball. A brilliant performance off the bench, slotting in seamlessly and helping Rovers maintain attacking pressure.